The breakthrough for Christianity in Kyushu came with the conversion of a handful of lords between 1560 and 1580: Omura Sumitada; Yoshisada and his son Harunobu of Arima; and, easily the most significant, Otomo Sorin of Bungo. This talk will consider how these events might fit into a larger project of global comparative history, which also considers cases from Central Africa, Thailand and Oceania 1450-1850. Why would rulers ever take the unusual step of abandoning the religious traditions of their vassals? The Japanese case is particularly intriguing because it presents us with the only substantial ruler conversions to Christianity across the whole of Asia. Yet, ultimately, Japan reverted to the Asian norm by officially rejecting Christianity once it was re-unfied, and this too is comparatively significant. 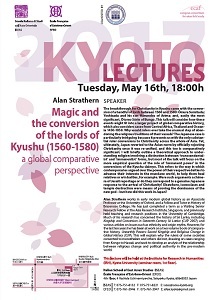 I will briefy outline a theoretical approach to understanding religion involving a distinction between ‘transcendentalist’ and ‘immanentist’ forms, but most of the talk will focus on the more empirical question of the role of ‘immanent power’ in the conversions of the Kyushu daimyo. This refers to the way in which contemporaries argued over the power of their respective deities to advance their interests in the mundane world, to help them heal relatives or win battles, for example. Were such arguments a chimera of Jesuit reportage or do they correspond to a genuine Japanese response to the arrival of Christianity? Elsewhere, iconoclasm and temple destruction were means of proving the dominance of the new god – but how did this work in Japan? Alan Strathern works in early modern global history as an Associate Professor at the University of Oxford, and a Fellow and Tutor in History of Brasenose College. He has just completed a term as a Visiting Senior Research Fellow at the Asia Research Institute, Singapore, and previously held teaching and research positions in the University of Cambridge. Much of his research has concerned the history of Sri Lanka, including Kingship and Conversion in Sixteenth-Century Sri Lanka (CUP 2007) and various articles on issues such as ethnicity and origin myths. However, for the last ten years he has been at work on a two volume book of comparative history, Unearthly Powers: Sacred Kingship and Religious Change in Global History (CUP). This will explain why the rulers of some societies converted to monotheism and others did not, drawing on cases ranging from Kongo to Hawaii, and seek to develop an analysis of the relationship between religious change and political authority in the pre-modern world.